Five hundred years ago, it has been estimated that perhaps one-thousand indigenous cultures practiced tattooing. Today, most of these groups have completely vanished from the face of the earth, and only a few continue to persist in the remote hinterlands of Asia, South America, Africa, Melanesia, and Polynesia. But even in these regions many of the living descendents of the world's original tattooing cultures maintain only a tenuous linkage to the once vibrant tattooing traditions of their ancestors. Sadly, only fragments of this once rich heritage of body art remain in our modern world, allowing us to partially glimpse into an indigenous past that now is largely inaccessible to direct observation; but one that connects tattoo, ritual, religion, myth, and nature from which indigenous tattoo culture ultimately sprang. But why was it important for indigenous tattoo artists to create permanent designs on the body? Were they made for purely aesthetic impact or for other more magical reasons? What deeper significance did these elements have for their makers and owners? And what did they communicate to others, if anything? 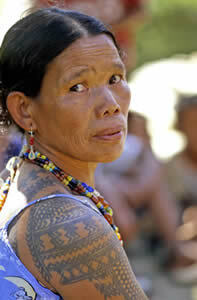 Maung was the last Iban tattoo artist of the Skrang River, Sarawak, Borneo. He bravely fought Japanese soldiers armed with heavy machine guns during WWII with a mandau sword, blowgun, and spears. He stated that all of the tattoos he created were "magical" because his protector spirit led him to a meteorite in the jungle which he later dipped in every batch of tattooing pigment he ever made. He said his tattoos protected him from Japanese bullets: "They just went around and through me and I was never wounded." Remarkably, of the some fifty-five Iban Rangers of the Skrang River who fought during WWII, all but one returned home alive. Maung died just hours after this photo was taken. Photograph © Lars Krutak 2009-2002. 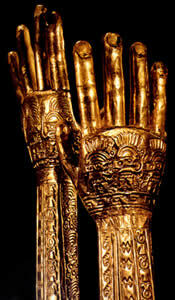 Burial gloves from the Chimú culture of Peru, ca. 1200 A.D. The tattoo designs reproduced in gold were meant to physically carry the tattoos and the deceased into eternity. The motifs incorporate iconography of mythological figures and other geometric designs taken from nature. It is believed that such symbols indicate shamanic or apotropaic functions. Similar tattoos have been found on the desiccated skins of Chimú mummies. For millennia, nearly all indigenous people who tattooed practiced shamanism which is the oldest human spiritual religion born at the dawn of time. Death was the first teacher, the edge beyond which life ended and wonder began. Shamanistic religion was nurtured by mystery and magic, but it was also born of the hunt and of the harvest, and from the need on the part of humans to rationalize the fact that they had to kill that which they most revered: plants, animals, and sometimes other men who competed for resources or whose souls provided magical benefits. Mythology developed out of these associations as an expression of the covenant between humans, their environment, and everything contained within it. But more importantly, it was a means of eliminating the guilt of the hunt, whether human or animal, and maintaining a certain essential balance between the living and the spirits of the dead. After all, shamanism is animism; the belief that all life - whether animal, vegetable, or human - is endowed with a spiritual life force. Spirits living in these objects were always propitiated and never offended. Sacrificial offerings, especially those made in blood, were like financial transactions that satisfied spirits because they were essentially "paid off" for lending their services to humankind or to satisfy debts like infractions of a moral code which most indigenous peoples around the world observed. For example, the heavily tattooed Iban of Borneo respect adat or the accepted code of conduct, manners, and conventions that governs all life. Adat safeguards the state of human and spiritual affairs in which all parts of the universe are healthy and tranquil and in balance. Breaches of adat disturb this state and are visited by "fines" or contributions to the ritual necessary to restore the balance and to allay the wrath of individuals, the community, or of the deities. Traditionally, such rituals included the sacrifice of a chicken, pig, or in special instances even another human - especially when a new longhouse was built. 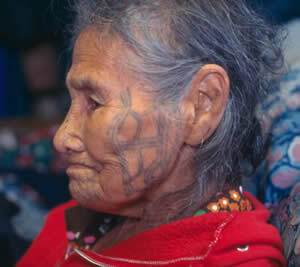 Chukchi woman with three fertility tattoos on cheek and a cruciform tattoo foil marking the corner of her mouth that was intended as a charm against evil spirits. Foils were also stitched into living skin if the individual had been in great danger and had escaped. After the death of a near relative, the Chukchi also fastened a single bead to a lock of hair to repel the "spirits of disease." Chukchi warriors who had killed other men sometimes tattooed anthropomorphic stick-figures on their shoulders in hopes of capturing the soul of their victim, thus transforming their "foe" into an "assistant" or even into a part of himself. Photograph ca. 1900. Perhaps the most common and important blood sacrifice practiced by many tattooing cultures worldwide was headhunting: the taking of human heads for ritual use. Human blood, the fertilizing essence of everything animate, was a highly revered sacred substance believed to appease spiritual powers that controlled the forces of nature. Among the prehistoric and tattooed peoples of ancient Peru like the Moche, Tiwanaku, and Chimú, ritually prepared human heads were perceived as potent sources of power to be harnessed and tapped in order to promote agricultural fertility and relations with the ancestral dead and deities. Analogs drawn from historical headhunting cultures of India, Borneo, the Philippines, Taiwan, China, and Brazil also support this model; because the ritual taking of human heads in these places was accomplished to ensure both biological and agricultural fertility, among other magical advantages. Apart from their role as the guardians of tribal religion, some shamans actively participated in tattooing traditions themselves. 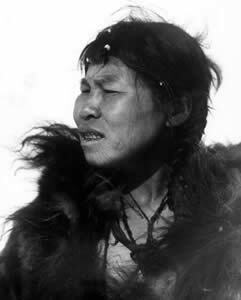 Among the Paiwan of Taiwan, the Chukchi of Siberia, and the Yupiget of St. Lawrence Island, Alaska, female tattoo artists - who were usually shamans - worked via supernatural channels to cure their patients of "soul-loss" which was attributable to disease-bearing spirits that could be either human or animal. Sometimes proper treatments included the application of medicinal tattoos at particular points on the body or "tattoo foils" to disguise the identity of the sufferer from such malevolent entities. 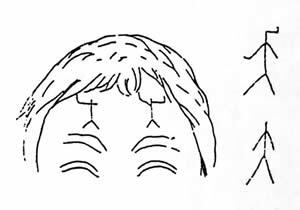 Of course, the Chukchi and Yupiget also tattooed fertility stripes on the cheeks of barren women or stick-like anthropomorphic "guardian" markings on the foreheads of men and women to harness ancestral powers. In all cases, Paiwan, Chukchi, and Yupiget shamans were proactive in rearticulating the surfaces of their patient's bodies by multiplying its inscriptions and reinscribing its parts. But the perceived efficacy of these treatments was not only confined to the technical or performative aspects of the tattoo application itself - although the tattoo pigments used by the Yupiget were considered to be "magical" and evil spirits were afraid of them. Rather, the shaman's power arose from helper and ancestral spirits who communicated their magical and curative powers through her. Not all tribal tattooists were shamans, however, because some were simply traditional healers who had particular specializations (e.g., eyes, ears, throat). In the northern Philippines, tattoo artists tattooed markings on the throats of patients suffering from goiter or other markings on the backs of individuals plagued by skin disorders. Yet many tribal tattooists did work under the guidance and protection of one or more spiritual helpers like Kayan tattooists in Borneo who were always female. In these instances, some tattoo artists were like shamans in that they employed methods of spiritual and physical medicine to "cure" their patients of serious conditions. 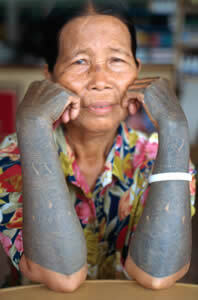 The Kayan tattooed a design called lukut or "antique bead" on the wrists of men to prevent the loss of their soul. When a man was ill, it was supposed that his soul had escaped from his body, and when he recovered it was believed that his soul had returned to him. To prevent the soul's departure, the man would "tie it in" by fastening round his wrist a piece of string on which was threaded a lukut within which some magic is considered to reside. Obviously, the string can get broken and the bead lost so the Kayan replaced it with a tattooed bead motif that has come to be regarded as a charm to ward off all disease. 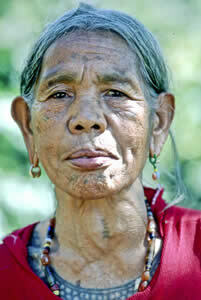 Interestingly, the Kalinga of the Philippines have a related belief. When blood is inadvertently drawn in the village, including that which flows during a tattooing session, a sipat gesture is made. The sipat is similar to an exchange of peace tokens, and begins with the sacrifice of a chicken whose blood is rubbed near the injured body part. A brief chant is given to ward off any evil spirits, and then a red carnelian bead (arugo) on a string is placed around the wrist of the person who was injured. This bead is also a protective device against malevolent spirits; it "pays off" any spirit in the vicinity. 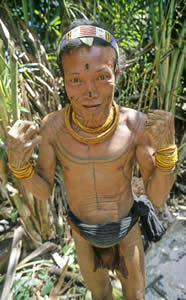 The Mentawai of Siberut Island also wear intricate bead tattoos on the backs of their hands. One man told me that these permanent beads "tied-in" his soul to the body but that they also made him more skillful whenever he needed to use his hands to perform various tasks. It should be noted that the Mentawai people are one the most profusely tattooed people living today and the reason for this, they say, is that their beautifully adorned bodies keep their souls "close" because they are pleased by beautiful things like beads, flowers, sharpened teeth, facial paint, and above all tattoos (titi). Tattooing has always been a creative process and depending on local environmental and cosmological forms and meanings, tattooing techniques were quite varied. In Papua New Guinea and other insular regions of Southeast Asia like the Philippines and Taiwan, lemon or orange thorns were utilized in hand-tapping tools; whereas in Polynesia hand-tappers preferred comb-like instruments forged from animal bones. In Sub-Saharan Africa, groups like the Makonde practiced skin-cut tattooing by carving designs into the living flesh with iron tools made by the blacksmith and then rubbing-in carbon pigments derived from the castor bean plant. The Native peoples of the Northwest Coast of North America like the Haida and Tlingit used hand-poking tools probably derived from Japanese sources although they are much smaller in scale. Each pigment brush was carved with a crest animal that imparted supernatural protection to the design thus created. Other indigenes like the Ainu of Japan and several Native American groups in California like the Hupa preferred obsidian lancets with which to slice open the skin; afterwards a sooty pigment was rubbed into the raw wounds until the skin felt like it was "on fire." Both groups practiced medicinal forms of tattooing and also more supernatural forms aimed at blocking evil spirits from entering the orifices of the body. Amazonian groups preferred various varieties of palm thorns to prick-in their tattoos, while the pre-Columbian Chimú seemingly skin-stitched their tattoos with animal bone or conch needles attached to sinew or vegetable threads - such tools have been found in mummy bundles. "Guardian" or "assistant" tattoos. In the Siberian Yupik language these marks are called yugaaq or "powerful person" and recall an ancestral presence. Drawing ca. 1900. A Laju Naga women living in Arunachal Pradesh, India reported that, "My ancestors will only recognize me after I die because of my tattoos." Photograph © Lars Krutak 2009-2008. The technique of skin-stitching was also practiced by more northerly Arctic peoples like the Yupiget, Chukchi, and Inuit until the early 20th century: a practice believed to be over 2,000 years-old. Tattooing here was always performed by women and tattooing in the traditional manner required extensive knowledge of animal products, pigments, and natural substances suitable for indelible marking. In the Yupiget and Chukchi areas, Lampblack was the primary pigment used to darken the sinew thread because it was believed to be highly efficacious against "spirits." However, fine dark graphite (tagneghli) was also used. Tagneghli was a magical substance obtained through barter in Siberia, and it was considered to be the "stone spirit" which "guards" humankind from evil spirits and from the sicknesses brought by them. Traditionally, it was used to protect village children from the possessive spirits that were "awakened" as a result of a recent death in the village. Lampblack or graphite was then mixed with urine (tequq) because it was also considered to be an apotropaic substance suitable for tattooing, perhaps because it came from the bladder: an organ believed to be one of the primary seats of the life giving force of the soul. In this connection, it should come as no surprise that some Yupiget elders of St. Lawrence Island told me tequq was poured around the outside of their traditional semi-subterranean houses called nenglu because "many years ago, urine was very special. It scared away the evil spirit." The intricate tattoos that appear on the wrists of the Mentawai people of Siberut Island, Indonesia are called ngalou or "beads," but this word also means "talisman." 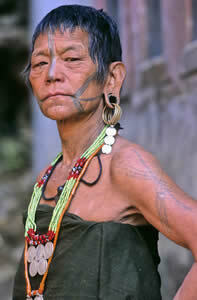 Like the Kayan lukut tattoo of Borneo they "tie in" the soul and keep it close to the body. 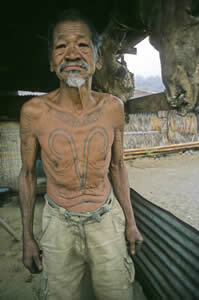 The rosettes tattooed on the shoulders of men (sepippurat) like shaman Aman Lau Lau (pictured here) symbolize that evil should bounce off their bodies like raindrops from a flower. Photograph © Lars Krutak 2009-2007. Kayan woman with hornbill, "shoots of bamboo", "guardian spirits," "dragon-dog," and tuba root motifs that are all believed to repel evil spirits. Floral imagery, symbolizing spiritual powers and relationships, permeates every facet of Kayan life. Plants are regarded as a major kind of living thing, sharing the same fundamental properties of life and death as humans. Photograph © Lars Krutak 2009-2002. 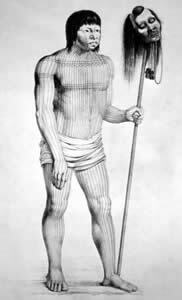 Full-body tattoos of a Mundurucú warrior with head trophy, ca. 1810. For these dwellers of the Brazilian Amazon, mythology states that their tattoos were given to them by their Creator god who had several avian characteristics. Tattooing for both men and women consisted of fine, widely spaced parallel lines applied vertically on limbs and torso, each motif reminiscent of an abstract series of long bird plumes enveloping the body. Human head trophies were believed to please the "spirit mothers" of the game animals thereby increasing the yield of the hunt and making game more tractable to the hunter. Buddhist monks in Thailand, Cambodia, Myanmar, and Laos utilize tools that resemble a sharp two-foot long metal skewer split at one end about two inches to form a needle-sharp pronged tip. The space created between the two needle tips acts as a reservoir to hold the tattoo pigment. These tools look much like a shish-kabob used to barbeque meat and vegetables on the grill. In Thailand, each tattoo is created by a master monk called an arjan. The inks that the monks use are personal recipes, and some are thought to have special "protective" qualities due to their unusual and magical ingredients. For example, some arjans use sandalwood, steeped in herbs or white sesame oil. Oil extracted from wild animals such as elephants in must, galls of tiger, bear and even cobra venom or the chin fat from a corpse are said to be used. Others mentioned that the exfoliated skin of a revered arjan was added to Chinese ink mixed with holy water to make their tattoo pigments. In these cases, it is believed the tattoo thus created from such an ink would cause those people who interact with the wearer to behave as if they were in the presence of a monk; that is, the tattoo would cause them to be somewhat reverent and treat the bearer of the tattoo with respect, among other things. Before a Buddhist tattoo master or arjan gives a tattoo, he must first read your aura to determine what design you need. Magical tattoos of this type have power because they not only draw on the power of the tattooist, but also his mentors, and the Buddha and his teachings. These are all sources of power (kung). In this way, Thais who follow Buddhism operate with a set of assumptions about the nature of the world, the beings and forces within it, and the ways these are related. These beliefs form an integrated system of ideas and propositions that they use to interpret the world and organize their daily actions. In some cases, enemies can be turned into friends with specific tattoos, while others provide their owners with personal protection, commanding and attractive speech, adding to a person's sacred virtue. Photograph © Lars Krutak 2009. A Khiamniungen Naga warrior from the Myanmar/India border with "tiger chest" tattoo. His V-shaped torso markings not only indicate that he is a successful headhunter, but that he could become "tiger-like" when he struck down his enemies. Photograph © Lars Krutak 2009-2007. Ainu woman of Japan with bold facial and forearm tattoos that worked to repel evil spirits from entering her body. 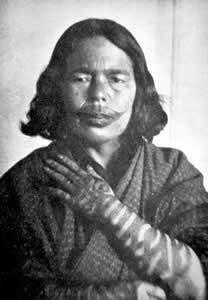 The Ainu also practiced medicinal forms of tattooing to relieve rheumatism. 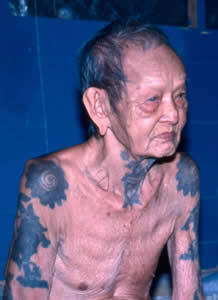 The last Ainu woman with tattooing died in 1998. Photograph ca. 1900. For thousands of years tattooing has been as much of a statement of worldviews in which humans, nature, and the supernatural landscape united as it has been an interlaced fabric that documents a range of ideas about the sacred geography of the skin - our most natural canvas. Tattooed images reveal a close relationship between humans and the rest of nature, and in the cosmology of the tribal tattooist humanity was thought of as an integral part of life's web on every level of existence. In the animistic universe, natural and supernatural forces were propitiated, cajoled, and appealed to for the benefit of humankind, because indigenous peoples sought to acquire access to the power of various animals, spirits, and the ancestors. But more than just skin deep symbols tattoos established visible linkages between these spiritual and natural domains by tapping into them, allowing the body to escape into a world where there was nothing but the magical essence of things detached from the here and now.